Androgen deprivation therapy (ADT) for the treatment of prostate cancer has adverse effects that may be difficult for men to tolerate. Dianna Shafer talks about the testing protocol when examining patients’ bones and what they prescribe to ensure their patients’ bone health is being addressed. Dianna Shafer talks about when testing shows metastasis, and how they use Xgeva when a patient is in this state. Pam Skurkay, Dianna Shafer, and Angela Hunter discuss the rates of incidences of this issue as well as the benefits of using Xgeva, including a better quality of life for patients. Pam Skurkay discusses the comparison rate of skeletal related events in bisphosphonates versus Xgeva. 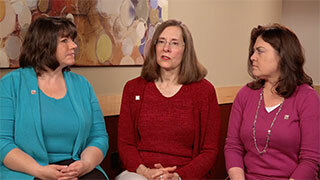 Pam Skurkay, Dianna Shafer, and Angela Hunter talk about how technology and new medicines are not only helpful for patients, but assists researchers and providers in finding more information including locating clinical trials. Pam Skurkay, Dianna Shafer, and Angela Hunter talk about following patients taking bisphosphonates and those who take Xgeva. Pam Skurkay talks about when providers consider prescribing one class of drugs versus another with factors that include the patient's insurance and overall health.